A Tarot spread for a year ... and for any long-term goals! This 7-card Tarot spread is a powerful tool to see where you've been and where you're going on your personal journey. Here's the layout and the positions for your very own yearly Tarot reading. 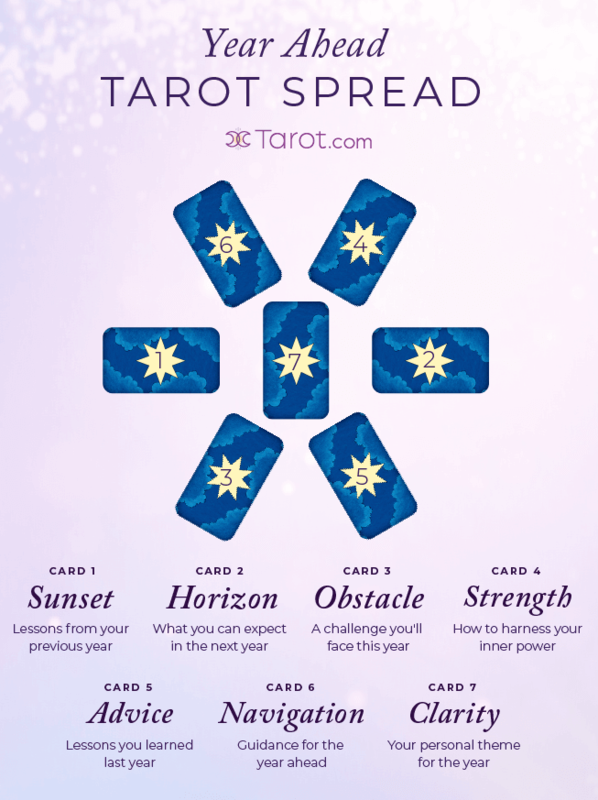 This Year Ahead Tarot spread is actually extremely versatile -- you can use it to get a deeper look at the new year, or anytime you want to look at long-term goals! 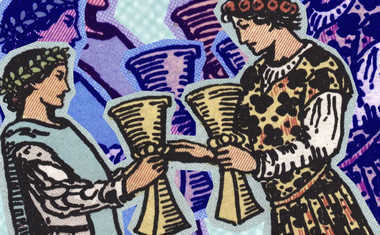 Use the power of this Year Ahead Tarot reading to gain insight, get clarity, find resolution, and make a transformation! It's time to reveal your year ahead! This first card in the spread looks at what you've accomplished (or not) in the past year. For this card, focus on the past -- but with an eye toward using that energy for the future. There is always something to be learned from the past, and it shapes who you are, so let this card take you back for a moment before we move forward. What do you want to achieve in the next year? What are your biggest hopes and aspirations? Choose your second card, and focus your mind on what you'd like to see happen in your life -- whether that's finding a new relationship, tackling a new career goal, or even just spending more time relaxing. Search inside yourself to determine your highest purpose for the year. Let's face it -- everything worth having comes with challenges. The important thing is to face them with thoughtfulness and poise. This third Tarot card will give you a glimpse at the type of challenge you may encounter as you strive to achieve the objective you set with the Horizon card. Now that you've seen your challenges, how are you going to resolve any issues that arise? Let the Tarot cards reveal that in this fourth position. What inner talents and strengths do you possess that can help you? What untapped energies exist that you can use this year? Let this Tarot card guide you and free you from doubt as you find the confidence to succeed. Now that you've looked back and determined where you want to go in the future, take a second to examine what you have learned so far. This lesson, whatever it is, will inform your next steps. What is this Tarot card telling you to do now? What happened last year that you want to avoid this year or what happened that you want to repeat? Ask yourself these types of questions as you look at the Tarot card to help yourself understand the lesson it's trying to impart. This is the card you have been waiting for. Look at the Tarot card and ask, "What do I feel right now is the very best action for me to take?" 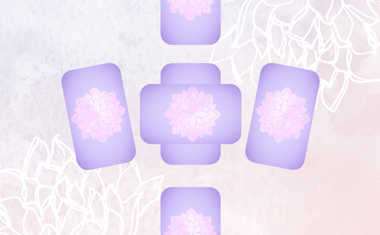 The card's character should help you focus your mind and your energy. You might want to write down your thoughts, or compile a list of the next steps you want to take on your journey. It's hard sometimes to see how to reach large milestones, but life is full of small moments that we can use to our best advantage -- if we take the time to plan and prepare ourselves now. Even though you have examined the lessons of the past, chosen your aim, and even looked at how to reach it, you may still need to find clarity. In this case, maybe focus on the big picture -- how does all of this fit into your overall life plan? What type of person are you hoping to become? What does this mean for your higher purpose? Use that energy to set your intention for the year to come, and tell yourself exactly what that is, say it out loud and imprint it in your heart and mind.